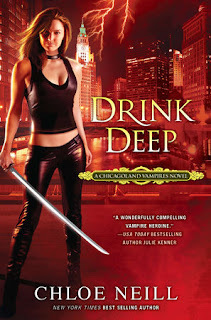 Note: If you haven’t read the first books in this series (SOME GIRLS BITE, FRIDAY NIGHT BITES, TWICE BITTEN, and especially HARD BITTEN) this review contains serious and unavoidable plot spoilers. Proceed at your own risk. Life has not been happy for the vampires of Cadogan House over the past couple of months. Not only have they lost their Master, but the house is in a sort of receivership. The Greenwich Presidium (GP), the body that oversees vampire affairs in Europe and America, has installed a receiver, Frank Cabot, in Cadogan House. Frank is the worst kind of auditor: he’s never met a rule he doesn’t like, and he’s only too happy to impose new rules and restrictions, just to throw his weight around the place. The resident vampires have no choice but to go along with his increasingly unreasonable demands; the GP will use his report to decide whether to disband the House. There are even bigger problems in the natural world. For instance, the fact that Lake Michigan has just gone from a normal body of water to an unmoving black mass. Just for good measure, the same thing has happened to the river. The humans of Chicago, most definitely including the new, not-supernatural-friendly mayor, immediately decide that the vampires are behind it. Merit thinks it might be the river nymphs. Turns out, the nymphs are devastated – and weakened – by the changes in the water. It’s pulling magic from the world. This cannot be anything good. In this installment, Merit is being pulled in every direction. Her House is very much under attack by members of the GP. The new mayor wants to institute a supernatural registration law. Merit has been having nightmares involving Ethan. Even Merit’s best friend, Mallory, is not herself. She’s undergoing testing to become a sorceress. The testing is so stressful that Mallory looks gaunt, shaky, and exhausted. Facing all of this, Merit decides that the best thing she can do is to solve the biggest problem first: the weirdness of the lake and river. Her investigation leads her through several supernatural creatures. Some we’ve met before, and some are new, to Merit and to readers. This installment is very fast-paced, matching the urgency of the issues faced by the characters. One of the biggest upsides to reading this series late is that I don’t have to wait for the next book to come out; I’ll be starting it very soon!